It was our last night in Sri Lanka, and it was a wrench to leave the country of elephants, gorgeous beaches, seafood, rice and curry. Our flight back to London was at 6am on Saturday morning, so we decided to have a decadent Friday night and dine at Nihonbashi, the number 45 restaurant in Asia (and number two in Sri Lanka). Yet another Dharshan Munidasa establishment, and after our amazing experiences at Ministry of Crab and The Tuna and The Crab, we were eager to try the Japanese cuisine at his first restaurant (he was a mere 24 years old when he opened it)! Nihonbashi is located just off Galle Face Terrace, down a quiet and unassuming street. But as soon as you pull up next to it, you know it’s something special. It exudes luxury, elegance, and charm, and the Yakitori garden at the entrance is only a small part of what is to come. 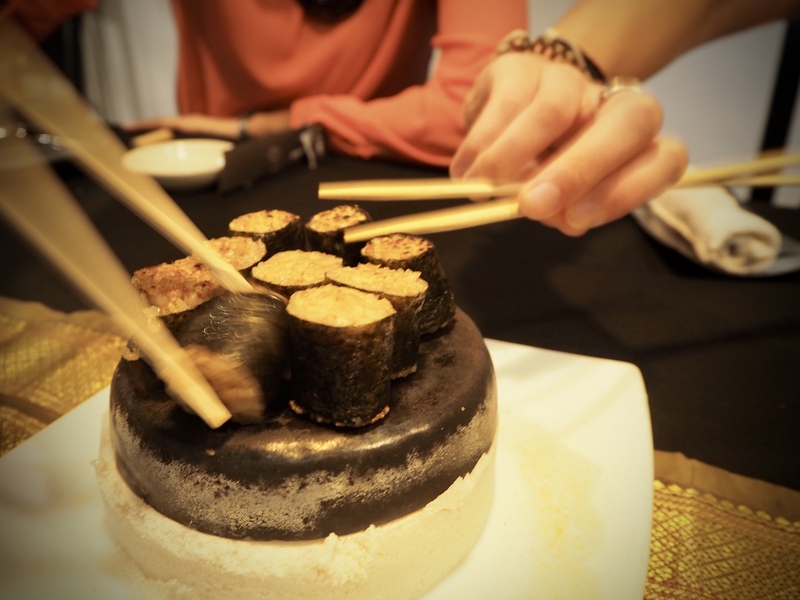 Besides the common dining area, Nihonbashi has the greatest number of private rooms of any restaurant in Colombo, which makes it a perfect choice for business dinners and special occasions. Each room has a different theme, but they all feel extremely exclusive and private (I particularly loved the wine room). We were hosted in the Taste Lab, where a lot of Dharshan’s culinary experiments take place – I felt honoured to be there! Our evening began in the aforementioned Yakitori garden, where we sat amidst bamboo plants, intoxicated by the smells wafting over from the grill, and marvelled at the number of skewers on offer. We tried various parts of the chicken (including the tailbone – a euphemistic term for another, certain body part), all of which were wonderful. I particularly enjoyed the minced chicken balls, which we dipped in egg yolk before eating, making it a wonderfully rich mouthful. The prawn skewers were another winner, with an incredible sauce that is apparently 23 years in development (and still keeps changing!). The only slight disappointment was the cuttlefish, as it was ever so slightly chewy. 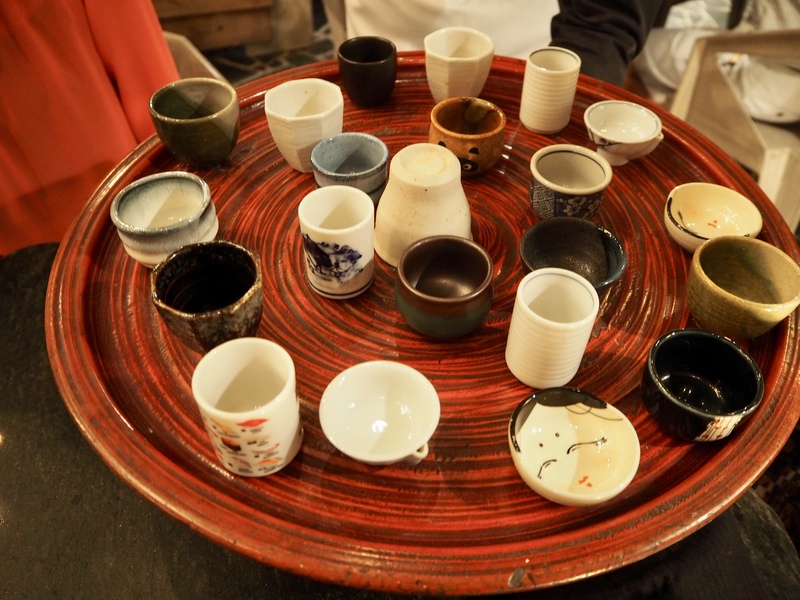 Along with the sticks, we started on sake, and the experience here was unrivalled. Our waiter brought us a huge tray full of sake cups, with various shapes, sizes, and designs, and we were able to choose our own. I definitely suffered from the paradox of choice, and it took me a good few minutes to select my favourite – the poor waiter’s patience (and arm muscle) was certainly tested! We then drank both hot and cold Gekeikkan sake over the course of the evening – I am quite inexperienced with sake, but loved this one (maybe a little too much… we definitely wobbled home). 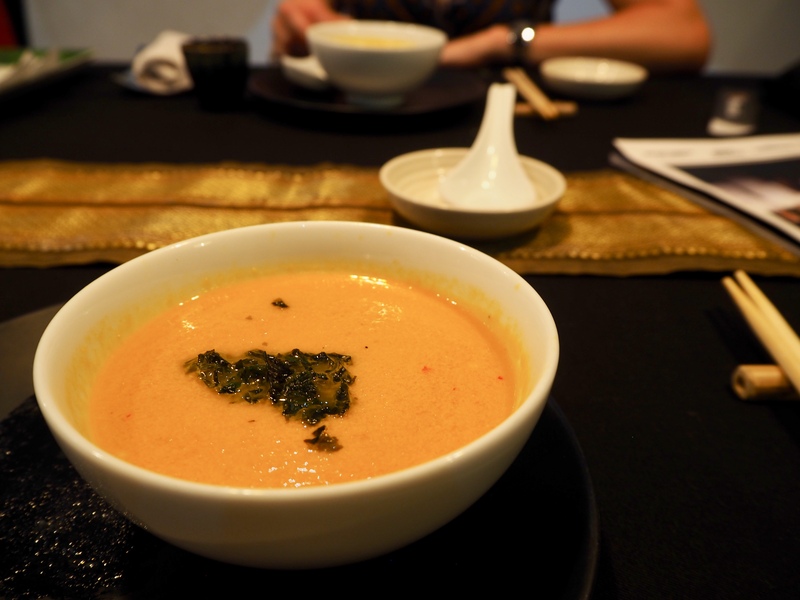 We then made our way up to the Taste Lab, where we fittingly indulged in the full tasting menu. The loyal readers among you will know I am a huge fan of tasting menus, as it is a showcase of the restaurant’s greatest dishes, and alleviates the pressure of choosing items yourself. And whilst most tasting menus are ludicrously overindulgent, at Nihonbashi the entire menu was quite light, meaning we didn’t feel ridiculously satiated afterwards. It would be an insult to call what we had a menu, as it was in fact more like a lovingly crafted novel. Stunning photography, historical descriptions, stories behind the dishes… it’s one I definitely want on my bookshelf. The team creates it all in house (including the advertising and PR), and Dharshan apparently even designed the restaurant on Excel! Now, to the food. 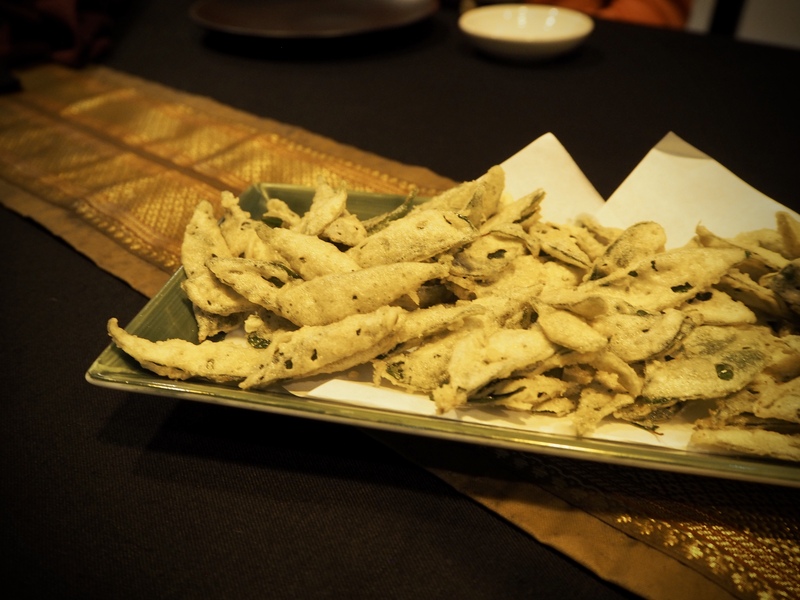 We started off with a little snack of curry leaf tempura, and our host rightly remarked that it was probably the only dish in the world where curry leaves are the star rather than the supporting act – and boy do they shine. Such a simple idea, yet so effective – I crunched on them non-stop and definitely had more than my fair share! 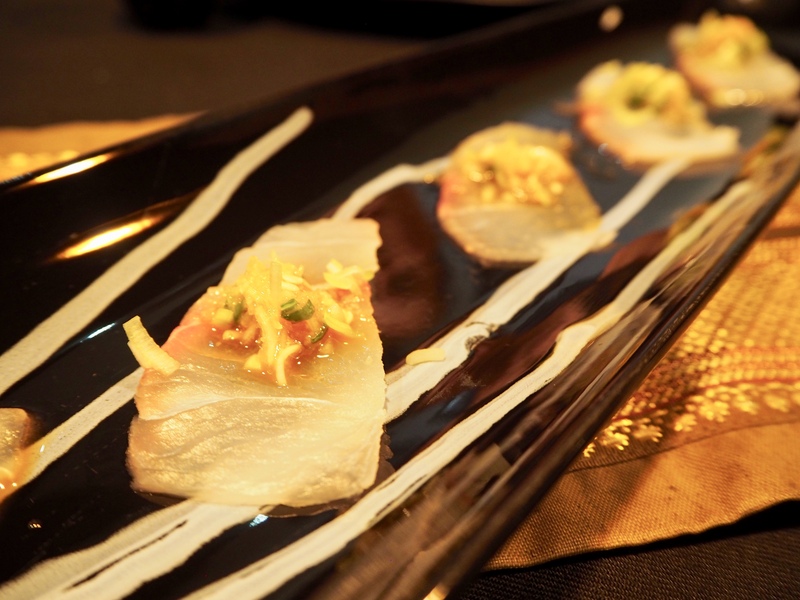 The sea bream sashimi was served on a beautiful plate, which we could see clearly as the fish was so thinly sliced. It was topped off with spring onion, sesame, and garlic, and was so flavourful that we didn’t need (and were actively discouraged from adding) soy sauce. And THEN, and then. I just can’t find words to describe this next dish, apart from the three words in the title. Quite possibly the best mouthful of meat I have ever had in my entire life. Dharshan is passionate about his “Say No to Fake Wagyu” campaign, and even donned one of the signature T-shirts whilst accepting his award(s) at the Asia’s Top 50 Restaurants ceremony. A worthy cause indeed, and shows his dedication to real ingredients – something that is also clear in his other restaurants, particularly Ministry of Crab. As my companion doesn’t eat meat, the restaurant whipped up a tofu dish for her, which was deliciously crispy, contained a burst of heat, and was served with a side of bonito flakes – Nihonbashi definitely succeeded in elevating what is usually quite a bland ingredient. Then we got a little surprise – a familiar dish! 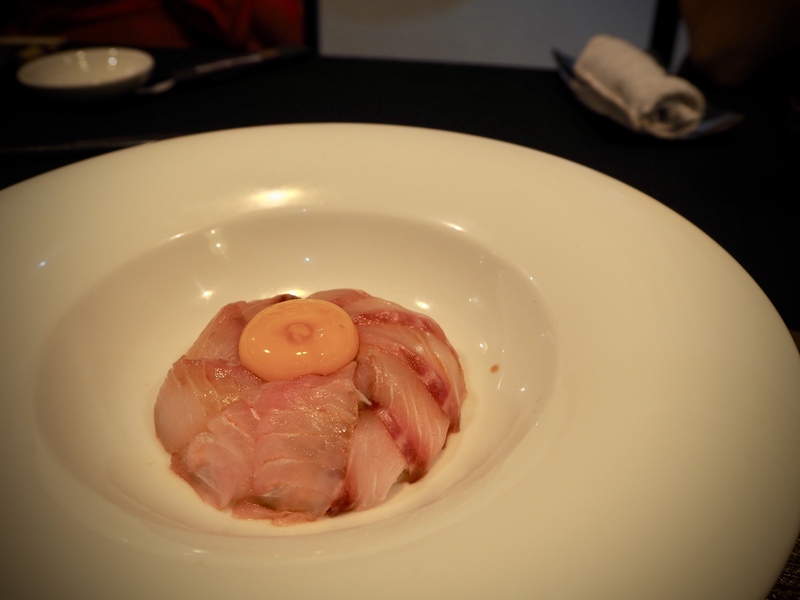 At The Tuna & The Crab, we’d had sea bream sashimi with an olive oil and garlic sauce, and the dish at Nihonbashi was similar, with a slight upgrade – adding rice on the bottom and raw egg on top. So when it came to drizzling the sauce (just as theatrically as the night before), it slightly cooked the yolk adding a wonderful creaminess to the dish. How long would the surprises keep on coming? 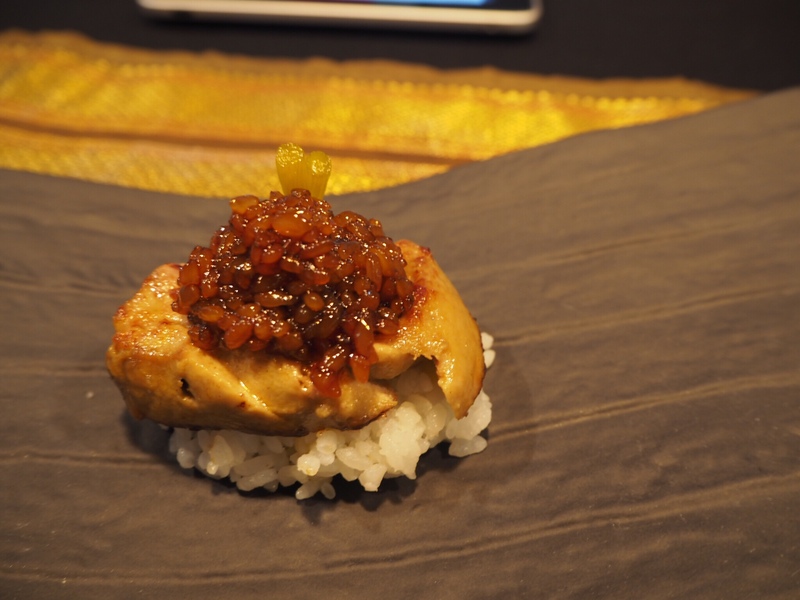 Next up was chargrilled foie gras nigiri. I’ve eaten foie gras a few times (most memorably in doughnut form at Taste of London), but I’d never had it this way, with such a smokey flavour. It was topped with teriyaki rice, and the sweet and salty flavours combined to blow my mind. Then it was time for a little more theatre with the garlic rice maki. Served on red-hot stone (ok, the stone was black), it arrived sizzling before our waiter sprayed soy sauce on it (with an actual spray bottle). We then all bonded by turning each piece over with our chopsticks until the rice was crispy on both sides. The garlic flavor shone through, and when I checked my notes on this dish, all I can discern was “nom nom nom”. Says it all, really. We ended our meal with “a cup of tea from the ocean” – a dashi stock made of seven kinds of dried fish, topped with seaweed. It was the perfect savoury ending, as it almost felt like a digestif, and was even served in a teacup to complete the illusion. 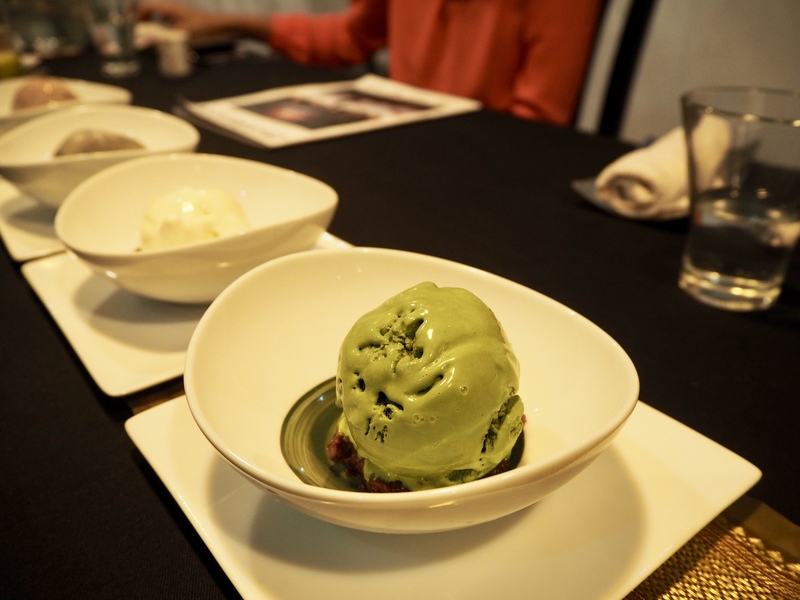 4 types of ice cream: Matcha, red bean, black sesame and… vanilla. “Vanilla?” we asked. Our hosts and the waiter nodded silently and stared at us as we took a spoonful. “Nice and sweet”, we remarked. And then, tears formed in my eyes as fire went up my nose. Yep, that was wasabi! I blinked, swallowed, and went for another spoonful immediately. What a unique idea and experience – I absolutely loved it! Nihonbashi is a breath of fresh air (literally, in such a polluted city), and feels classy and upmarket, but not overly pretentious. 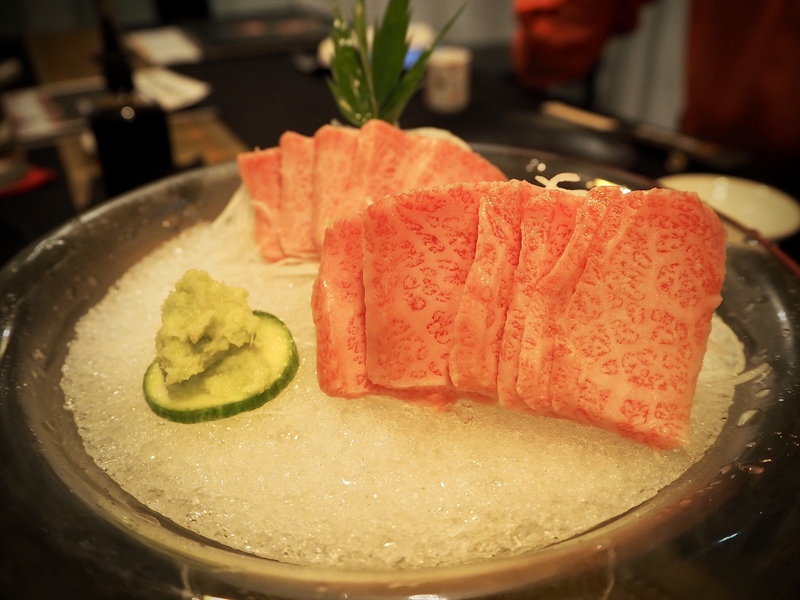 Indeed, when it first opened, it was more about Japanese comfort food than its current focus on fine dining. Despite that, I liked how our waiter was jovial and sweet rather than serious, cracking jokes about the vanilla ice cream and our wonderment at the various theatrical antics. Dharshan’s team is incredibly ambitious – they do pop ups all over the world, have innovative and creative dishes, and are not afraid to take chances and try new things. When he first opened Nihonbashi all those years ago, he had the ambition to be the number 1 restaurant in Sri Lanka. It’s now at number 2, but I’m sure it doesn’t mind being a back seat to its own sister, Ministry of Crab. The 8-course tasting menu at Nihonbashi costs 11’000 rupees, or around £50, which is a bargain compared to what places in the West charge. It includes most of the dishes we had, so I do highly recommend going for that! I hope Dharshan’s group of restaurants continues to flourish and succeed – I cannot recommend them enough. A warm welcome in an already warm and welcoming country, I am sure they will continue to surprise and delight for many years to come! 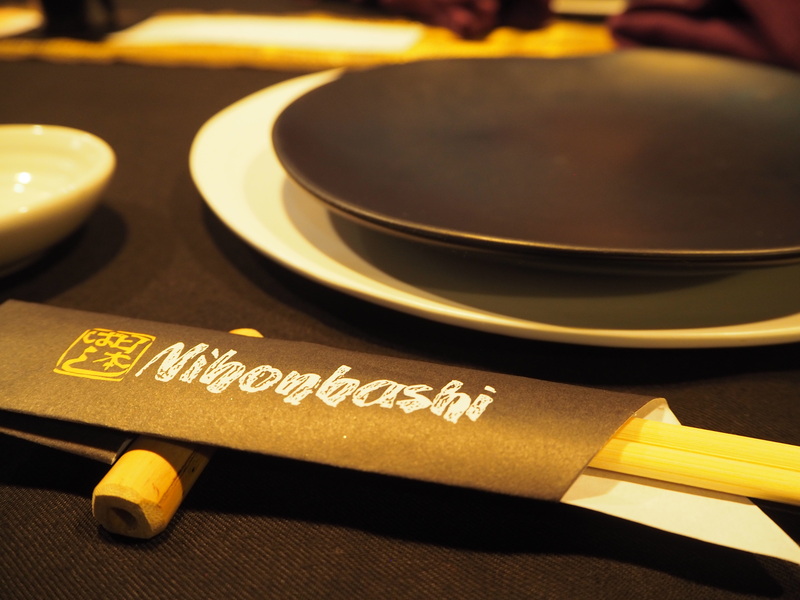 I was a guest at Nihonbashi as part of a hosted PR dinner. Rest assured, as always, all opinions are my own, and that wagyu beef sashimi was every bit as good as I described it to be.